Defending champion Ronnie O'Sullivan powered into the World Championship semi-finals with a 13-3 demolition of 2005 winner Shaun Murphy. O'Sullivan, trying to win his sixth world title, won seven out of eight frames to set up a repeat of last year's final against Barry Hawkins. Hawkins beat Dominic Dale 13-12 in a thrilling quarter-final after the Welshman had won seven frames in a row. Mark Selby reached the last four with a 13-5 victory over Alan McManus. Selby, the 2007 runner-up, could now face Judd Trump, who holds a 9-6 lead over Australia's Neil Robertson going into the evening's final session. Hawkins had needed just two frames as he led Dale 11-5 heading into their final session, only for Dale to launch a stunning comeback which saw him win seven frames in a row and move within one of victory. It would have equalled the biggest comeback win (from six frames down) in a Crucible quarter-final - the overall record is from eight behind, by Dennis Taylor in his 1985 final victory over Steve Davis - but Hawkins showed great resilience to hold himself together, winning the final two frames with breaks of 66 and 65. "Dominic played unbelievably well," Hawkins, who banged the table several times in celebration after clinching the final frame, told BBC Sport. "He kept me off the table for long periods and it gets tough, so I am chuffed to bits the way I held myself together in the last two frames. It has to be up there with my best ever performances with the pressure I was under." Dale, who has never been in the sport's elite top 16 or progressed beyond the last eight at the Crucible, was philosophical about his ultimately unsuccessful comeback. "Obviously at 11-5 up he can only lose it really and I have to play out of my skin to mount a comeback. I played really well but I don't think I had anything to pot in the last two frames. I didn't do anything wrong, he just found his 'A' game." Selby is among the possible final opponents for O'Sullivan, should he get there, and the Leicester player secured his semi-final place by winning the second frame of Wednesday's morning session against McManus after resuming 12-4 ahead. "I'm looking forward to it and can't wait to get out there," said Selby, who reaches his third Crucible semi-final, having been runner-up to John Higgins seven years ago. O'Sullivan, who is the overwhelming favourite to secure his third successive title, won with a session to spare, although the 38-year-old said he had overcome an issue with his cue following Tuesday's session. "I had to change my tip after yesterday," he told BBC Radio 5 live. "You want to get comfortable with that. When the tip isn't right - no matter how well you're playing - you're maybe not 100% confident with performing all the shots you want to play. I managed to make most of them though." 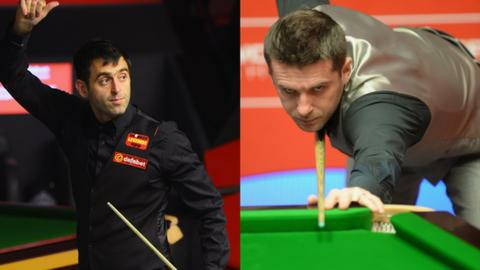 Asked about dominating Wednesday's session, O'Sullivan added: "I kept getting let in quite easily. I was scoring off Shaun's errors. "I was never really thinking I had the win. I played each frame at a time and tried to score with every chance I had and play good safety."